Reply, 'Mr Dunlop C[oncerning] Mr Ferguson', signed by William Cullen and William Chalmers. They advise that Robert Fergusson is suffering from neither a venereal disease nor [bladder] stone, but an enlarged prostate. Mercury and cicuta are prescribed, with dietary advice. 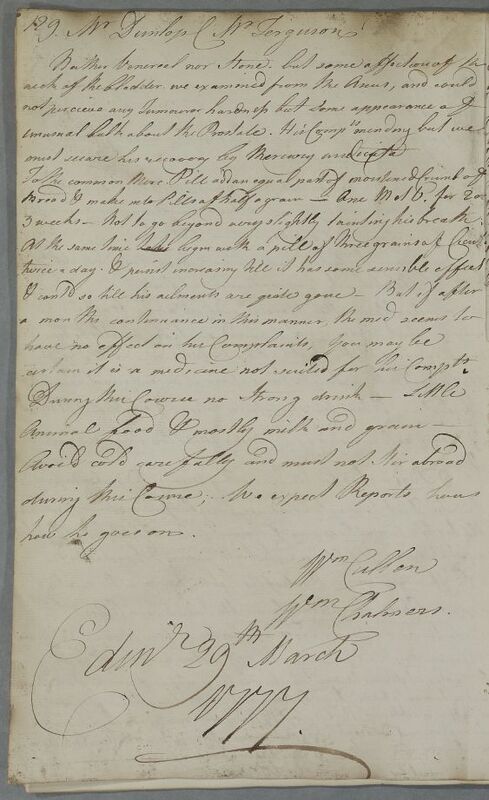 Summary Reply, 'Mr Dunlop C[oncerning] Mr Ferguson', signed by William Cullen and William Chalmers. They advise that Robert Fergusson is suffering from neither a venereal disease nor [bladder] stone, but an enlarged prostate. Mercury and cicuta are prescribed, with dietary advice. certain it is a medicine not suited for his Complaints. certain it is a medicine not suited for his Compts.